It's been a banner year for Elon Musk's SpaceX. 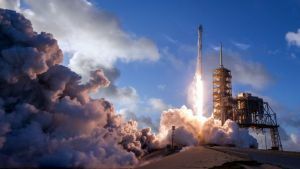 As humankind ventures farther up the Earth’s gravity well, it’s been a banner year for Elon Musk’s commercial spaceflight venture SpaceX. Case in point: Business Insider reports that SpaceX has shattered the record for commercial rocket launches in a year, at 20. That beats the prior record of 18 launches in a year — which was also set by SpaceX, in 2017. Before that, the figure stood at 16, set by United Launch Alliance in 2009. SpaceX has one more launch scheduled for 2018 — a satellite called GPS Block IIIA, which will improve location tracking services for the U.S. Air Force — bringing the company’s total tally of launches to 21. It’s worth noting, though, that the 21 launches falls short of Musk’s most optimistic prediction for the company in 2018: that it would launch more rockets than any country on Earth. That honor, Business Insider found, went to China, which has launched about 35 rockets this year. Musk has had a tough year in the press, with drama as his electric car company, Tesla, struggled to bring its Model 3 compact to market. But the launch record comes as a bright cap to a year — and just weeks after Tesla reportedly managed to churn out 1,000 Model 3 vehicles per day. An earlier version of this story referred to traveling “into” Earth’s gravity well, when space travel actually entails going up the gravity well. It has been updated.